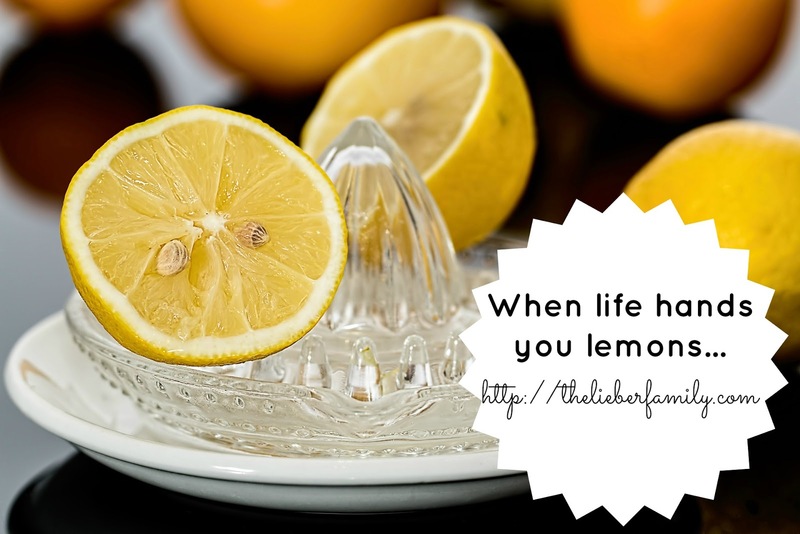 When life hands you lemons, you make lemonade, right? I love lemonade. It's so crisp and refreshing. It's my go to drink order around the house and in restaurants. When I was pregnant I even had the waitstaff bring me two at a time because I drank them so fast! Well we've been dealt some real lemons lately. The most recent involves our house. We had a buyer who wanted a quick turnaround. We had a month to get out, so that he could get in. He was offering cash and didn't have a place to live in the meantime, so we did what we could to accommodate his request. There wasn't anything on the market that suited us at that time, so we decided to look for a place to rent. We actually found what looked like a perfect deal: a 3 bedroom house across the street from Frances' best friend. The owner was headed out on a mission trip and wouldn't be back until April 2017. She even let us sign a 3-month lease so that we could get out quickly if we found another home. We signed the lease and started moving stuff. It went slowly at first, mostly because Ken and I both have full time jobs and otherwise full schedules. I was loading up my van each evening and unloading it the next day on my lunch break. We set a date for the last weekend of September to rally the troops and get everything out. I called and cancelled all our utilities. Then the buyer backed out. I cried for about two days. I'm not entirely sure why he backed out, though it was within his legal rights. He says he was concerned about some things in the inspection report, but he never mentioned which things. I've seen the report and I don't see any deal breakers for an almost 70 year old house. My biggest problem is that he never allowed us the opportunity to remedy anything. We even offered a price break and there was still no conversation. For the sake of my sanity and my well-being, I've forced myself to move on. I don't want him to have our house anyway! I want someone who will enjoy it and have as much love and life as we did there. In my eyes, there's nothing wrong with the house, it just doesn't fit us anymore. We decided to carry on as planned. We picked up the truck, directed the volunteers and loaded up the truck (three times!) to get stuff out. 75% of our stuff is going into storage because the house we are renting is fully furnished. That actually made the move easier, since it all got delivered to one place and unloaded Tetris-style into the storage unit. We've settled into life in a new home this week. There are lots of things to get used to; mainly not knowing where anything is! Thankfully, things have gone pretty well, and even though it's not Tuesday for a list of ten, and it's early for Thankful Thursday, I'm going to go ahead and make my list of ten things I'm feeling thankful for. I need some lemonade in my life right now. 1. We don't have a dishwasher, but Frances has offered to help out with the dishes while we're in this house. She actually argued with my mom after our first dinner there because she said she'd made a commitment and she was going to do it. I'm proud of the young lady she is becoming and I'm not nearly as worried about the teen years (which start in a week!) as I used to be. 2. We don't have a/c in this house either. It was never that big a deal for perpetually-cold me, but I was worried about Ken and the kids. Well, the weather has taken a nice turn and with the windows open, the house is quite pleasant. 3. The bedrooms are all together. It's been a long time since I could easily check on all three kids at bedtime. Frances being upstairs had thrown that off. It's also easier to wake them up and monitor them in the mornings. I like having all of us there together. 4. The basement is half-finished and where we've decided to put the TV. This is nice because we can go downstairs in the evenings and watch TV without worrying that we're keeping the kids up. It's nice to have the busy areas separated from the quiet areas. 5. It's employee evaluation time at work, and that might make some people worried, but this hasn't been a concern for me at all. Work has felt like my sanctuary with all the other upheaval that's going on. I like my job, I do it well, and I am recognized for that. And my position is flexible enough that if I need time off, it's very easy to take it. 6. Our new house has a nice flat yard and a driveway. Benjamin loves riding his bike or scooter up and down the driveway, and Henry has had a great time running around in the backyard. He's even noticed the kids behind us and their play structure. He's getting all the details before he goes over to introduce himself and test out the toys! 7. The neighborhood is nice too. As I mentioned, Frances' best friend lives across the street. She came over yesterday to see Frances' room and talk. We've met one other family that has a daughter Henry's age, and I'm sure that we'll be meeting other neighbors soon. 8. The neighborhood is also flat! Benjamin and Ken went on a walk/ride a few nights ago. Ben was able to ride his bike while Ken walked with him. There were no hills to contend with and the streets are wide enough to accommodate cars and pedestrians. 9. We've been sleeping with the windows open to enjoy the nice breeze at night. I've noticed how much quieter it is where we are now. We used to hear a lot of vehicle traffic, music, and conversation in our old neighborhood, but now there's much less of that. I"m pretty sure I even heard a cow one night! 10. There are boxes all over the place, I'm not sure where my stuff is (in the house, in storage, still at the old place, etc. ), and we've still got lots of details to iron out; but the reality is I'm feeling much more settled now that I was a month ago. I'm not sure why. It's quite possible that it's just a defense mechanism. To be honest, I really don't want to examine it too closely. I'm feeling settled and that's enough for me.